“Michael was so impactful, so present, and so much larger than life. 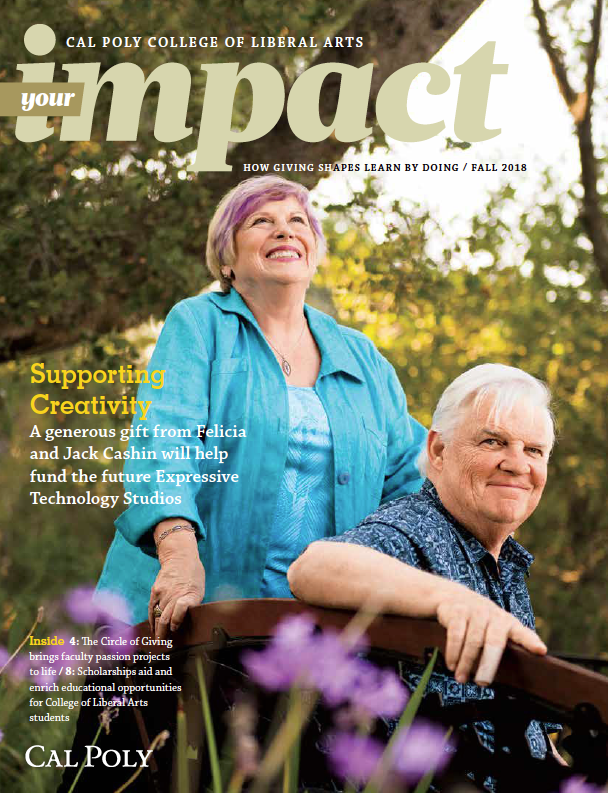 He was a giant, but his ability to connect made you feel like there was nothing else in the world besides you and him,” said former student Leonard Bessemer (BFA, Applied Art and Design, 2008) at Michael Barton Miller’s Cal Poly memorial service on Jan. 10. Miller — Art & Design professor, artist and friend — passed away Friday, Nov. 14, 2014, at the age of 65, after a two-year battle with brain cancer. His wisdom, humor, kindness and love for different people and cultures touched the lives of all he encountered. Growing up in Phoenix, Ariz., Miller was interested in art and culture, participating in school plays and creating visual art projects and films. His interest in art led him to join a film collective in Berkeley after graduating from Arizona State University with a political science degree. It was during this time, in the mid-1970s, that he nurtured his artistic skills and fed his passion for art — a period of experimentation with painting and drawing that resulted in several commissioned murals. Looking to further his artistic pursuits, Miller returned to school, earning an undergraduate degree in art at UC Irvine in 1986 and an MFA from USC in 1988. After completing his MFA, he worked at the Meyers/Bloom Gallery in Los Angeles and then transitioned to education, teaching in the Los Angeles area. 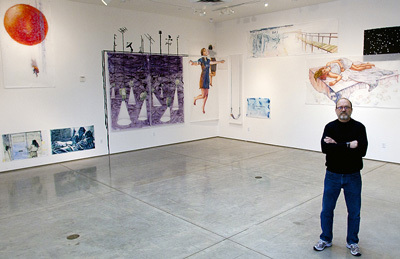 He joined the ranks of the Cal Poly Art & Design faculty in 1997 and taught drawing, intermedia and critical art practice. While Miller made an impact wherever he went, it seems his greatest impression was made on the students lucky enough to hone their craft under his mentorship. “He walked into my first art class — my first class at Poly — wearing dark blue jeans, a denim shirt, black glasses and black work boots,” said James apRoberts (B.S., Applied Art and Design, 2002). “I couldn’t figure out if he was on loan from the prison, or if he was the coolest person I had encountered to date. Respected by both students and colleagues, Miller’s work and teaching were recognized with the Cal Poly Distinguished Teaching Award and the College of Liberal Arts’ Richard K. Simon Award for Outstanding Scholarship or Creative Activity, both in 2005. While he was an influence to many in the classroom, his own work was displayed at well-known venues, among them, the POST Gallery in Los Angeles, the Art Centre at Silpakorn University in Thailand, the Torrance Art Museum, and the Patricia Sweetow Gallery in San Francisco. 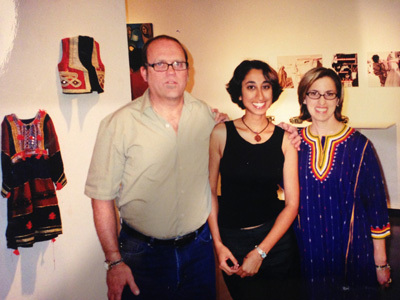 “Even while pursuing his own projects and showing his work in galleries, he always made extra time to be with students outside the classroom,” remembered Sabiha Basrai (B.S., Applied Art and Design, 2004). Miller is survived by his Art & Design Department colleague and wife, Tera Galanti, daughter Mariah, and stepson Thomas. The family asks that donations made in his honor be designated to the Visiting Artist Guest Lecture Series in the Art & Design Department. List “Art & Design Department Visiting Artist Guest Lecture Series” in the “Gift Fund Name or Number” field. Read more about Miller’s life and impact on the Art & Design Department website.